Second Edition Brings Warhol, Basquiat, Koons, Lichtenstein and more to Miami BeachMIAMI (November 2011) – Arts For A Better World (AFABW), the unique international fair that debuted during Art Basel Miami Beach 2010, is set to present its second edition at the Surfcomber Hotel (1717 Collins Avenue), kicking off with a private VIP opening on Tuesday, November 29. Collectors, dealers, curators, artists, journalists and opinion leaders will browse works from famed artists within a 20,000-square-foot tented space, elegantly and innovatively designed around the hotel's pool and cabanas. An art show with a clear vision, unifying statement and deep artistic soul, AFABW charges itself with the mission of creating awareness that “Art Can Contribute to a Better World”. AFABW features an international selection of top galleries along with a special curated space called the Better World Museum, a program of special artistic projects, public and private events and live street art happenings. AFABW will host more than 20 galleries chosen to fulfill a clear curatorial statement based on the illustration of their desire to contribute to A Better World. Exhibitors have been hand selected by a highly experienced team of curators and advisors Sebastien Laboureau and Martin Gerlier of Moonstar Fine Arts Advisors. Through photos, sculptures, oils, inks, silkscreens and more, AFABW will explore art from all regions of the world while supporting all possible forms of artistic expression. “When we established Arts For A Better World, we wanted to present a show that addresses what we consider the essence of the art world,” says co-founder Sandrine Kukurudz. “We feel it is important to address the act of creation and the message delivered by artists through their works. To be able to share how works impact the world in which we live and how some artists have permanently changed one’s vision of society and way of life is refreshing and fulfilling,” says curator Sebastien Laboureau. AFABW will offer a wide artistic selection from all over the world. Major artists from the secondary market will be shown in the Better World Museum, including the world-acclaimed LOVE by Indiana and a well-known APPLE canvas by Andy Warhol as a tribute to Steve Jobs. In the “galleries” section, AFABW will explore various aspects of artistic expressions. 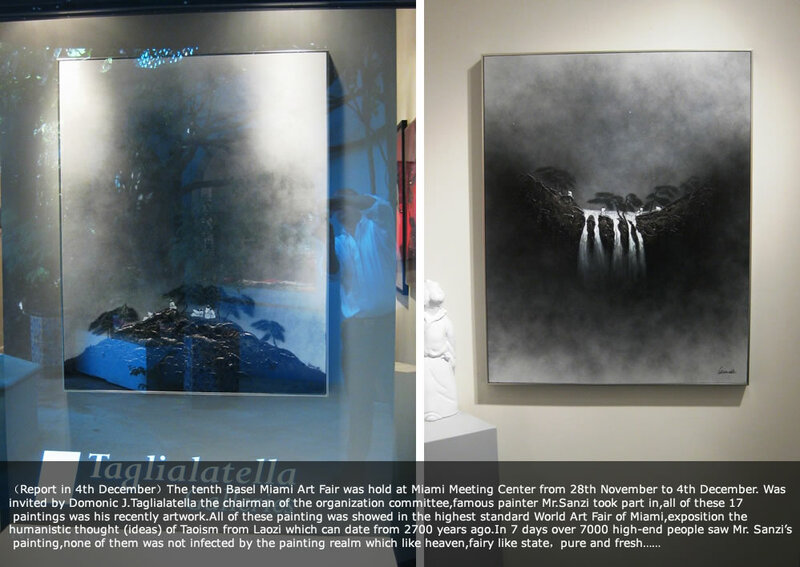 Two eminent Chinese contemporary artists will show their works for the first time in Miami Beach: Sanzi sharing his inspired and poetic landscapes and Huang Zhiyang, perhaps the most remarkable Chinese abstract expressionist painter. Fairgoers will also be treated to joyful works by French artist Claude Viallat, a major figure of French painting and one of the founders of the movement “Supports-Surfaces”. His colorful works form a sort of fabric poetry, accompanied by a harmony that radiates from the surface. His works are also currently shown in Miami at the Frost Art Museum, together with ORLAN, also shown at AFABW, the first artist of her generation able to chart a viable course out of the Body representation, towards the integration of humanist values and the use of her own body as a medium. AFABW recognizes how critical education is to society and will serve as a forum for education for adults and children alike, presenting a range of panels, conferences, roundtables and other activities. Sunday, December 4th will be a family day at AFABW. Children will have the opportunity to work alongside street artist ChaNoir, a renowned Franco-Colombian artist and member of the Street Art movement, decorating temporary walls. 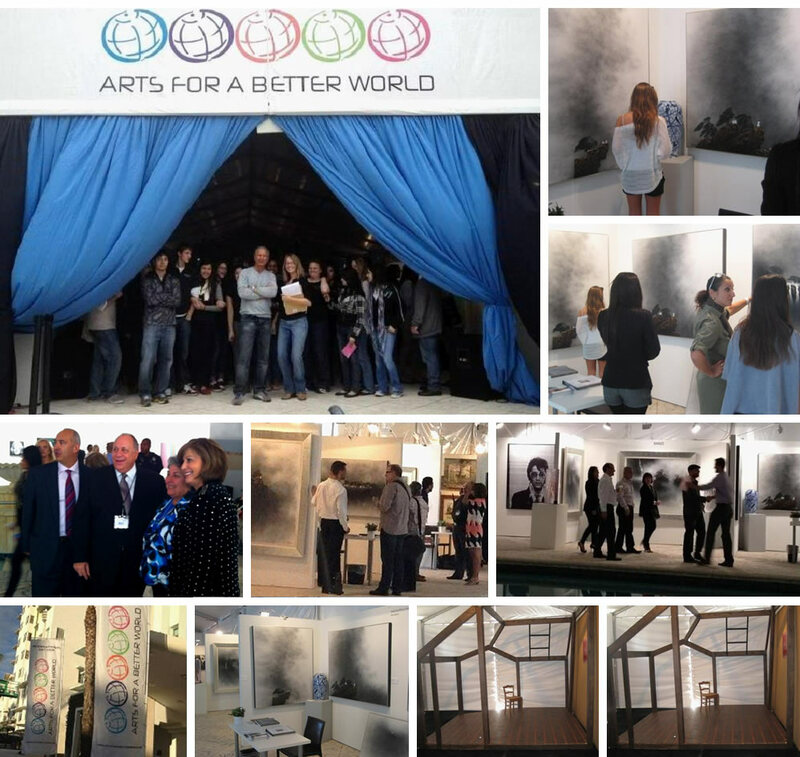 With furthering education in mind, AFABW, in partnership with the Katherine M. Taglialatella Foundation, will introduce a blueprint for galleries worldwide to establish partnerships with schools to provide underprivileged students with an art education they would not have access to otherwise. Street art finds a new home at AFABW, on the street as well as in galleries and auction houses. Famed Los Angeles artist Speedy Graphito, a pioneer of the street art movement, will perform - painting temporary walls at the Surfcomber Hotel’s entrance - at the VIP Opening and throughout the fair. Some of the walls will be auctioned to benefit not-for-profit organizations. AFABW Featured Artists: Andy Warhol, Arman, Betsy Stewart, Carlos Cruz Diez, ChaNoir, Charles Maze, Claude Viallat, Claudia Ferrari, Dario Perez-Flores, Edward Miller, Ellen Sandor, Fernando Porras, Flore Sigrist, Huang Zhiyang, Idan Zareski, Jean-Michel Basquiat, Jeff Koons, Jeffrey Pitt, Jesus Rafael Soto, Joe Zammit-Lucia, Joel Grossman, Keith Haring, Laurent Harari, Lawrence Schiller, Manuel Merida, Marc Ash, Marcos Marin, Mauro Corda, ORLAN, Rek, Rob Hay, Robert Indiana, Roy Lichtenstein, Russell Young, Sanzi, Shonagh Adelman, Speedy Graphito, Steve McCurry, Tom Wesselmann, Victor Vasarely, Victorio Montoro Zamorano and Yom de Saint Phalle.